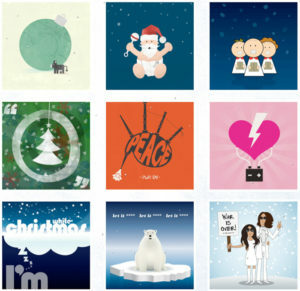 Salford-based design and digital agency Carbon Creative has launched a range of free designer Christmas cards that are also helping to raise money for a number of charities including Cash for Kids, Mind and Shelter. The nine cards have been designed ‘conceptually’ to illustrate Christmas chart hits as well as traditional carols. The cards are free to send but if you are feeling generous this Christmas you are invited to make a small donation to one of the charities of your choice. Carbon Creative an award winning graphic design and digital agency based in Salford Manchester. Established in 2002 as one of the first creative companies in the UK with a commitment to become carbon neutral. The company has received media and press interest for its continuing environmental campaigns, most notable was the launch of a tree planting campaign in 2006 dedicating trees to be planted in Salford and Greater Manchester for clients and for every order placed. In 2007 the company relocated to business premises to facilitate the inclusion of green power generated from 100% renewable energy. In April 2010 Carbon Creative was awarded Winner of the Salford Business Awards — Green Award for its environmentally friendly business operations within the city.Today Carbon Creative continues to innovate in ethical and sustainable business practices working to promote the clients and values it cares about. Solid company growth has seen further commitment with the launch of www.treeinspired.co.uk and a relentless passion to plant more trees, currently standing at over 3,700 tree dedications as of 2011.